One of the most misunderstood parts of civil lawsuits is the monetary damages that an injured party (plaintiff) receives, or appears to receive. There are so many different rules governing damages that the average consumer – and jury member ­– are not told about. It can be confusing, especially when the jury-assessed amount seems too large. Sometimes the largest portion of the damages goes not to survivors or their attorneys, but to insurance companies and government agencies. I have gone to trial for many clients. When the corporate or individual defendant is found at fault, the jury decides what the amount of the damages should be, based on the applicable law and the facts that were presented during the trial. A personal injury damage verdict may include two types of damages: compensatory damages and punitive damages. In this blog, I focus on punitive damages. 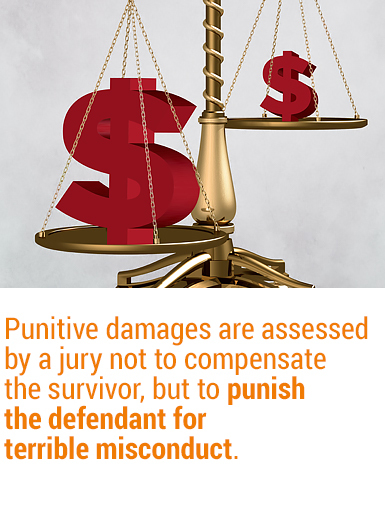 Punitive damages are assessed by a jury not to compensate the survivor, but to punish the defendant for terrible misconduct and to keep others from getting hurt. A corporate or individual defendant’s actions must be intentional or reckless, not just negligent, to result in punitive damages. And before a claim may be brought in Oregon state court for punitive damages, a judge must first review the evidence before trial and determine whether it is sufficient for a jury to consider punishing the defendant. If a jury assesses punitive damages, the court must then review that decision, and a defendant may seek to have the amount reduced based on various factors. As a result of the tough requirements for punitive damages, they are relatively rare. Most attorneys are never able to make a successful claim for punitive damages in their entire career. The widow of a man killed by cigarettes proved that the cigarette manufacturer engaged in a pattern of lying for decades, and violated the civil racketeering laws. Insurance consumers were able to punish an auto insurer for reducing payments for auto collision medical bills by arbitrary amounts in order to save the company money. An injured worker successfully showed he was discriminated against for filing a workers compensation claim. In one of our cases, we showed that a real estate seller committed fraud in misrepresenting the water supply for a rural family home. Sometimes, the court reduces or takes away the punitive damages that were assessed by the jury. The survivor will be left with only 15%. This amount can then be taxed, further reducing the survivor’s share. This entry was posted in Understanding the Legal Process. Bookmark the permalink.